Itty bitty Baby Groot stole the spotlight in the newly-released trailer for Marvel’s Guardians of the Galaxy Vol. 2, but he’s not the only star that’s shining. Appearing for just several seconds at the end, Mantis makes her debut in the MCU demonstrating telepathic abilities in a hilarious moment fans will be quoting long after the movie is on Blu-ray. Played by Pom Klementieff (Oldboy), Mantis is an alien raised by Ego. 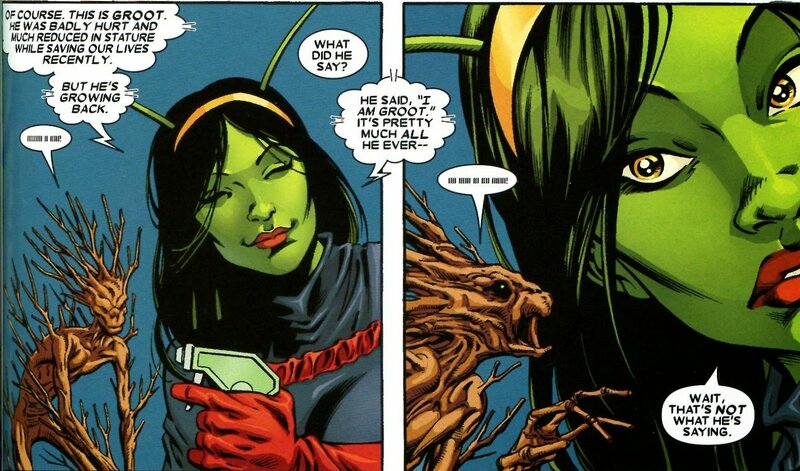 Producer Jonathan Schwartz says Mantis lacks social cues and will spend the movie learning “social intricacies” and “dealing with people,” hence why she carelessly reveals Star-Lord’s (Chris Pratt) deep feelings for Gamora (Zoe Saldana). This version of Mantis is shaping up to be a major departure from Mantis in the comics. Appearing in The Avengers #112 in 1973 and created by Steve Englehart and Don Heck, Mantis is the half-Vietnamese, half-German daughter of Libra, of the Zodiac Cartel, who was raised by the Kree in a Vietnam temple. The Kree believed she was the Celestial Madonna and trained her so she would prepare to birth the Celestial Messiah. She later joins the Avengers fighting against the likes of Thanos, Ultron, and several more. A little-known fact is that Mantis was also a DC Comics character for a brief time, when Englehart included Mantis (renamed Willow) in an issue of Justice League of America #142. Klementieff’s sharp comedic timing and chemistry with the cast have already won Marvel fans over, who have taken to Twitter to express excitement over the character. Mantis in in Guardians of the Galaxy 2. Sold. One fan also pointed out hopes that Mantis shows off her “signature fight move.” In the comics, Mantis displays an adept ability and targeting weak and pressure points in an opponent’s body, which has allowed her to knockout even the most powerful of beings, like Thor. Guardians of the Galaxy Vol. 2, directed by James Gunn, will be released May 5, 2017. Come and get your love.